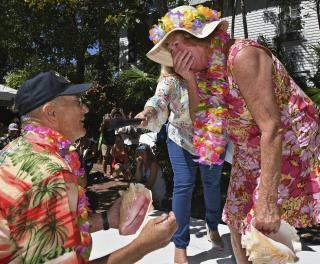 (Newser) – A Florida retiree has won the women's division in Key West's annual Conch Shell Blowing Contest—and accepted a marriage proposal from a fellow competitor. Seventy-year-old Mary Lou Smith impressed the judges Saturday with long blasts on the fluted, pink-lined shell. And when 73-year-old Rick Race proposed on stage, she accepted by joining him in a joyous duet, per the AP. Other winners included Florida Keys resident Vinnie Marturano, who won the men's division after blowing three-toned blasts and a song fragment.